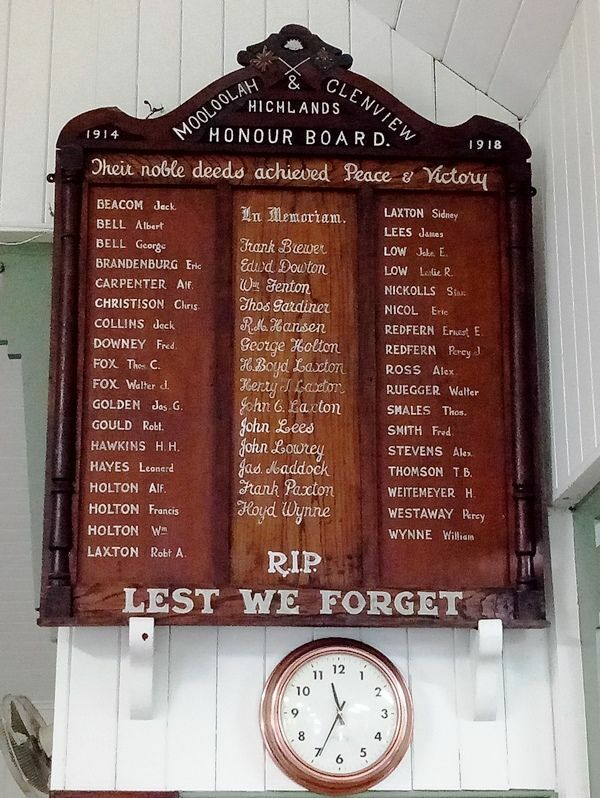 The honour roll commemorates those from Moolooolah, Highlands and Glenview who served, died in service or were killed in action during World War One. The Honour Board was unveiled in the Mooloolah Hall by Mr J. Forsyth M.L.A on the 28th September 1917. The Mooloolah and Glenvale Branch of the Queensland Farmers Union was mainly responsible for the erection of the board with public subscriptions defraying the cost. During the afternoon a jumble sale was held in aid of the Mooloolah Wounded Soldiers Recognition Fund and about £400 was raised. The Brisbane Courier , 5th October 1917.